I don’t know how long it has been since i dove into a fiction novel like a warm sunlit sea, looking forward all day to the moment of the dive, to hang weightless in a world of words. I had wondered if the internet had killed that pleasure in me but no, it is alive and strong, only needing the time and the space to thrive. This summer season I rediscovered novels. I read three great books, and I feel well nourished and grateful. The first book is Howard Jacobsen’s The Finkler Question. I picked it up at the little self-serve book kiosk near the Whaletown ferry dock. “Man Booker Prize 2010 Winner”, puffed the jacket. There was a receiptÂ for 2 bucks from the Salvation Army store in Courtenay stuck into the book, on the back of which was scrawled A JUNK BOOK.Â A difference of opinion. Well alright then. I accepted the challenge, put 75 cents in the cookie tin, and shoved the book into my pannier. The Finkler Question has the supreme chutzpa to tackle the thorny question of Jewish identity – and I gotta say, you maybe really do have to be Jewish to know what a twisted ball of string that is. The book is set in London and revolves around three men, their friendship, and their various betrayals. The protagonist is Julian Treslove, a goy and a Jewish wannabee. Treslove is a blandly handsome guy who is a complete wreck at relationships, and whose job consists of being a rental stand-in for celebrities at parties. His two best friends are both recently widowed Jews: the elegant, elderly Libor Sevcik, and the cocky Sam Finkler. Treslove is trying desperately to fathom the whole Jewish thing. What does mean, exactly, to be Jewish? Is it a culture? Philosophy? Political stance? Religion? Birthright?Â Why are his two friends constantly arguing about it? Even the word “Jew”, he recognizes, is proprietaryâ€¦why is it that Jews can call themself Jews with impunity, while he might be labelled anti-semitic for using the word? As a non-Jew he can’t very well bring up the Jewish Conspiracy, or the Jewish Question, can he? Even in jest? No. He cannot. And so he arrives at The Finkler Question â€“ with the word ‘Finkler’ substituted for ‘Jew’ throughout, as necessary. What is up with those Finklers, why are they so filled with pride and self-loathing? What’s with the neurosis? And why has Treslove been mugged by a mysterious woman, who (he thinks) may have called him a Jew while relieving him of his watch and wallet? And what about Palestine? It is a hilarious and brilliant book. Whoever put the note in it and left it at the book stand was an idiot. The second book is Elizabeth Gilbert’s The Signature of All Things. (I did a blog post about Elizabeth Gilbert and Eat, Pray, Love a couple of weeks ago, intending to write about Signature of All Things, but I got sidetracked. As usual.). I borrowed The Signature of All Things from the Cortes library, which is now housed at Linnaea Farm.Â Cortes Island has renewed my love of libraries, and for that, my gratitude knows no bounds. I only had to wait a month or so for this popular book to trickle through the hold lineup, and then had only three weeks to read it, which made the reading even sweeter. The Signature of All Things follows the life of Alma Whittaker, born in Philadelphia in 1800, the sheltered daughter of Henry Whittaker, a nouveau-riche botanical pirate. Henry is actually the most interesting character in the book. In fact, the characters are all rather two-dimensional, but that’s OK. The book lavishes in plot and setting, all gorgeous botanical gardens and exotic South Sea islands. This is practically made to roll as a screenplay so no doubt it will be a very expensive Hollywood movie soon, and probably a bad one, but nevermind. Enjoy the book before that happens. Here is what is most pithy about The Signature of All Things: the central theme of evolution. Evolution, as evidenced in biodiversity, and by extension, by human sexuality and the drive to reproduce. It looks at Alma’s life as an alternative model of sexuality and relationship – her love, both global and human, within, above, and beyond the body. It extends from Darwin’s finches to Alma’s obsessive study of mosses, to the great paradox of human altruism â€“why would anyone act in a way which does not further the species? What is the purpose of the sexual urge? Why would anyone choose not to breed?. Which to me is the clincher: the great leap, from physical to conscious evolution. It’s a delicious read full of rich, chewy ideas. 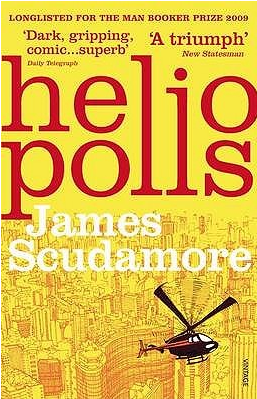 The last novel, I just finished this morning: James Scudamore’s Heliopolis. Another great library find, this one pulled randomly from the stacks. Attracted like a bee by its sharp yellow cover. Heliopolis is set in a semi-futuristic Sao Paulo Brazil. The hero is Ludo, who is plucked as a baby from a squalid ghetto life by a couple of ultra wealthy philanthro-capitalists. His childhood is spent on their opulent hobby farm, until as a young man he is whisked off to college in America, and then planted into a job at a prestigious, sleazy p.r. firm. Ludo moves fluidly through the warren-like favelas and the gated communities and exclusive high-rise condos of Sao Paulo, where the rich travel in above the city in private helicopters. Heliopolis digs deep into the paranoia of the owning class, and the complex social reality of the slum-dwellers. Heliopolis is marinated in dark humor, and the language is crystalline. A beautiful, beautiful read. The island library is open Monday, Wednesday, and Friday. Today is Sunday. Tomorrow I will bike to the farm and slide Helipolis into the return slot, and then browse through the four high shelves of fiction. I will choose one book, sit on the old log by the lake, and crack it open. With a good book on the go, life is fine.